"The Long Hot Summer" was the title song from the 1958 film starring Paul Newman, Joanne Woodward, Anthony Franciosa, Orson Welles, Lee Remick and Angela Lansbury. (How's THAT for an incredible cast?!?!?) It began climbing the charts on its own strength just as its A-Side, "Oh-Oh, I'm Falling In Love Again" was making its final descent. Because "The Long Hot Summer" never rose above #49 in Cash Box Magazine (and, inexplicably stalled at #77 in Billboard), it became eligible for our special Favorite B-Sides Poll. Coming close to disqualification was "Waltzing Matilda", the B-Side to Rodgers' 1960 Hit "T.L.C. Tender Love And Care". It peaked at #41 in Billboard all on its own, one position away from elimination. (In order to qualify as a "Favorite, Forgotten B-Side", the A-Side of the record HAD to be a National Top 40 Hit ... but the B-Side could NOT be a Top 40 Hit on its own.) Just as strangely, this side failed to chart at all in Cash Box. starring Gregory Peck, Ava Gardner, Fred Astaire and Anthony Perkins ... and shows once again the diversity of different musical styles that Jimmie Rodgers introduced us to in the early days of Rock And Roll. Finally, the flipside of Jimmie's 1967 "comeback" hit "Child Of Clay", a personal favorite of mine that we featured at the beginning of this series, was nominated ... and, as such, Rodgers' version of "Turn Around" earned some of your votes in our B-Sides Poll. This one's a folk music standard, first introduced by Harry Belafonte back in 1959 on his "Love Is A Gentle Thing" album. Here's what some of you had to say about Jimmie's movie theme "The Long Hot Summer", a #49 hit in 1958 (and the flipside of his Top 20 Hit "Oh-Oh, I'm Falling In Love Again") after our B-Sides Series ran. Here's one I eagerly flipped over way back when, since I was (and am) a movie nut. In fact, I MAY have bought it for The Long, Hot Summer. As you know, I was no child when this one came out and my tastes leaned more towards melodic ballads than bouncy pop tunes so this one gets my vote. Jimmie seemed an odd choice for a major motion picture theme song, but he sure did it well. For me, nothing by Jimmie outranks "The Long Hot Summer." The combination of that song and the opening scenes of the film make for an unforgettable audio-visual experience. Thank you so much for "The Long Hot Summer". I LOVE that song, and the movie is one of my favorites. This is one incredible man! 1957. There are not too many years of rock's 'golden era' that can match that singular year. Think about it: Elvis makes his final appearance on the "Ed Sullivan Show" and purchases "Graceland." Paul Simon and Art Garfunkel form "Tom and Jerry." Pat Boone stars in two films, "Bernardine" and "April Love." Bo Diddley records "Hey, Bo Diddley." John and Paul meet at St. Peter's Church in Liverpool." "American Bandstand" premiers on television, and, while it can't quite be considered a 'rock' classic, Leonard Bernstein completes his work on "West Side Story." Not a bad year for great singles, either. Elvis scores with "Jailhouse Rock," "Teddy Bear," "Loving You" and "All Shook Up." Pat Boone scores with "Bernardine," "Love Letters In The Sand," "April Love" and "Don't Forbid Me." Sonny James and Marty Robbins crossover from country to the pop charts with "Young Love" and "A White Sport Coat." The Everlys hit with "Wake Up Little Susie," Jerry Lee Lewis contributes "Great Balls of Fire," The Crickets amaze us with "That'll Be The Day," Little Richard gives us "Lucille" and "Tutti-Frutti," and Sam Cooke delivers "You Send Me." Roulette Records artist, Buddy Knox, scores with "Party Doll," and a label mate, James Frederick "Jimmie" Rodgers bursts upon the national scene with his chart topping "Honeycomb." I was an eighth grader at Starr King Elementary School in Sacramento in the fall of 1957 when Jimmie had his first #1, "Honeycomb." In the midst of all the great rock and roll songs -- to say nothing of the great 'pop' icons who were still having hits like Doris Day, Perry Como, Frank Sinatra and others, here was this very refreshing new talent singing about how the 'Lord made the bee and the bee made the honey." It was different. It was distinctive. It was pop, it was folk, but one thing was for certain: it was a smash. I was already a huge Elvis, Ricky Nelson and Pat Boone fan and a member of their respective 'fan clubs.' I called the radio stations faithfully to request their latest release, not that I really had to. All were 'automatic' adds at the local radio stations. But when you were a member of their fan club, you would do anything and everything to support your favorite 'star.' By the fall of 1957 I'd already scored my first major interview for my elementary school paper, meeting Ricky and David Nelson on the set of television's "Adventures of Ozzie and Harriet." I'd also started working as a radio 'gopher' and teen news announcer at KRAK Radio, then a 50kw Top 40 station serving Stockton and Sacramento. When I heard Jimmie's hit record I knew I'd have to find a way to interview him. And I could hardly wait for a follow-up single. I didn't have to wait long. Another #1, "Kisses Sweeter Than Wine," managed to stay in the Top 100 for over twenty weeks the later part of 1957 and well into 1958. 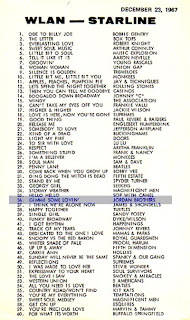 Then, a succession of other hits: "Oh, Oh, I'm Falling In Love Again," "Secretly," "Are You Really, Really Mine," and others. By that time, however, I had joined Jimmie's fan club -- run by his secretary and assistant, Merry Stevens, and -- on a trip to Los Angeles with my folks in '58 -- I made it a point to visit her at their fan club office on North Highlands Avenue, south of Sunset Blvd. As all of us "Forgotten Hits" readers know, it was an era of hit singles. It was all about the '45.' Albums often contained a hit or two, but were also made up of 'filler' tunes. You often felt a bit disappointed when you paid $3.99 for an album - a lot of money for kids who typically made fifty cents to a buck allowance -- only to find one or two tracks you really enjoyed. With Jimmie, however, I began to get into the entire album, not just the hits. That's where Jimmie's folk sound really came through. Songs like "Woman From Liberia," "Waltzing Matilda" "Froggy Went A Courting," "Soldier, Won't You Marry Me," and "Black Is The Color of My True Love's Hair." These songs became favorites of mine and fifty+ years later, merely reading these titles evokes wonderful memories of a era when our passion for music denominated our lives. We could hardly wait to get out of school so we could rush home to tune in "American Bandstand." We waited patiently for our favorite singer or group to come out with a new single or album. Sometimes, we were a bit disappointed but not so with Jimmie. His songs -- and the distinctive sound he brought to them -- never let me down. I knew I had to interview Jimmie and when I heard he was coming to the California State Fair in August of 1958, I got my chance. I called Merry and she arranged for me to meet Jimmie and his wife, Colleen, at the Sacramento Inn. My friend, Bob Jones, accompanied me and we had a wonderful visit. We even met their two poodles, "Honeycomb" and "BeeBee." The interview was my first published feature in my high school newspaper, The El Caminian, shortly after I began my freshman year. Over the next year or so I entered several contests that Jimmie's fan club put on from time to time. We were asked to write a story about our favorite song or we'd get 'points' for mailing out post cards to radio stations requesting Jimmie Rodgers songs. I'd get periodic notes or autographed photos from Jimmie from time to time and when I learned he was to appear at the Venetian Room of San Francisco's world famous Fairmont Hotel, I called Merry once again, asking if she could arrange for me to see Jimmie. The arrangements were made and my Mother and I drove over to San Francisco to attend the concert. Since San Francisco was my home town, and since we would always stay with my Grandmother at her home on Guerrero Street, we would not have to rush home to Sacramento immediately after Jimmie's performance. The Venetian Room was one of the top showrooms on the West Coast, much like the Empire Room at New York's Waldorf - Astoria, or the Coconut Grove Ballroom at the Ambassador Hotel in Los Angeles. Ernie Hecksher and his Orchestra provided the music -- it was a big band, not a combo -- and everyone from Nat "King" Cole to Ella Fitzgerald, to Cab Calloway to Pat Boone played the room. There were two shows, a dinner show at 8 PM and a cocktail show around 11. It was a suit and a tie affair. Everyone dressed up if they were going to The Fairmont. My Mother and I were escorted to our seats by the Maitre de, and they were right near the front of the room, just to the right of the stage. The menu offered everything from salads and sandwiches to full dinners. An evening at The Venetian Room was not a 'cheap date.' It was expensive by late 1950's standards, and we were very careful what we ordered. If I recall, my mother had a house salad and I had a sandwich. Still, the bill, with 'cover charge' and gratuity, was probably in the twenty-five dollar range. That sounds like a pittance today, but in 1959 and 1960, it was a lot of money! After we'd finished our meal and the waiters had bussed the tables, the audience was ready for the show. Jimmie came out decked in a black tux. He did all his hits and some of those equally familiar folk songs. Jimmie had this distinctive curl in the middle of his forehead and it was his trademark, so to speak. His gracious smile, his warm voice, his friendly demeanor filled the room. Then, just as I was getting into the show, it was over. My Mother and I had a wonderful visit with Jimmie that night at The Fairmont and the memory of that dining experience is fondly remembered fifty years later. My Mother and Father are gone now, as is Jimmie's first wife, Colleen. I can't begin to recall what Jimmie and I spoke about that night but I'll always be deeply indebted to him for the generosity he showed a sixteen year old fan and his Mother. I caught up with Jimmie several times after that evening. One was his 'comeback' performance at the Coconut Grove Ballroom in Los Angeles after he had recuperated from his December, 1967, beating on the Hollywood Freeway. There he was, up on the stage, wearing the familiar black tux, and sporting the spit-curl. I was managing The Beach Boys then, so when the check came, I gladly paid for my own meal! Jimmie also recorded an album with Jimmy Bowen in Nashville. It was in the late 70's. I visited him briefly at the recording studio -- and we spoke to each other once or twice since he's been living in Branson -- but that evening at The Venetian Room in San Francisco's Fairmont Hotel fifty years ago -- remains one of my favorite remembrances of my fifty-two years in radio and records. Several folks who were not on the list back in 2007 when the Jimmie Rodgers story broke have written in asking for more details. We found a number of pieces in the archives surrounding Jimmie's 2007 surgery and feel it's easiest to replay these pretty much the way we received them. A greater outpouring of love, appreciation and prayer for an artist throughout the oldies community would be hard to imagine ... and to this day Michael Rodgers believes that it was the combination of this love and prayers from all of his Father's friends and fans that pulled him through this very critical time. My name is Michael Rodgers. My Father's name is Jimmie Rodgers. Some of you might remember him from his musical career that has now spanned fifty years. In 1957 he recorded a song called "Honeycomb" and followed it up with a string of hit records totaling 25 top ten singles, eighty million records sold worldwide and concert appearances throughout the world. Through all of that he carried himself with grace, charm and an incredible sense of humor and style. In 1967 when he was 33 years old my Father was injured in what is now known as a road rage incident. He suffered severe head injuries and underwent three brain surgeries. During one of those surgeries, he lost 28 square inches of his skull on the right side of his head. Since 1968 he has carried what is considered to be the largest steel plate ever implanted in someone's head. It took Dad nearly 15 years to recover from the last surgery in 1968 as he had to learn to walk, speak and regain his motor skills. He was not supposed to live more than 10 years with this steel plate in his body as the body continually tries to reject these kind of implants. Over the years as he has gotten older the skin on his scalp has gotten thinner and the remaining bone continually cuts his scalp. If left this way, this situation will eventually lead to his death. Over the last 15 years he has had over 60 different skin graphs and other surgeries. The last such surgery was 18 months ago and it nearly killed him. He now has a hole in his head the size of a half dollar and it has been this way since February. My Dad is tough. He is the definition of the word. He has avoided what is about to take place and tried everything imaginable to live with the constant pain and discomfort and he has now made a decision that will define what will be the rest of his life. On Thursday June 28, 2007, a team of Brain Surgeons in Hot Springs, Arkansas, will remove the steel plate that he has carried with him for 39 years. They plan to remove the outer layer of skin and lift the plate away from the position it has held covering the outer layer of his brain. If successful, they will replace the plate with a new material that has been developed that will recreate the skull bone and will not be rejected by the body. If this surgery works he will have the chance to live what is left of his life without pain. Dad has made the decision. The doctors feel confident that all will be fine and we are stepping out on faith that this is the right course of action. *** Please pray for my Father that his surgery and recovery will be successful and that his health will be completely restored. *** Please pray for the team of doctors and nurses that will be performing the surgery so that they might have guidance and wisdom during this time. *** Please pray for our family that we might have strength and courage to face the days ahead in helping Dad with his recovery. *** Please put my Father, Jimmie Rodgers, on your prayer lists at church or through an email request such as this one. (Feel free to copy and send). All of us are connected in this life in some way. I believe there is power in prayer and power in positive thought. I believe that together all of us, through prayer and positive energy and thinking, can help that to happen. Thank you all for being a part of and playing a part (large or small) in my life. My family and I thank you. And my Father thanks you and will be most appreciative to you for your thoughts and prayers. Whoa ... the Jimmie Rodgers story as related by his son just brought me to tears! God Bless Jimmie, and may he rally through this surgery! God help him! I had no idea all of this had happened to Jimmie Rodgers. I am so sorry. Thank you so much for passing the message on. Jimmie certainly has my prayers. I had no idea anything happened to Jimmie Rodgers. I am glad he is recovering. I appreciate his son letting us know he is doing OK. Kent, I can't begin to tell you how much I appreciate your efforts. You add quality to my life. Every time you send me the latest, I feel like I have won something. Everyone on your list has to appreciate your intelligence and journalistic abilities and your from-the-heart-drive to keep this music alive. You are a real hero to me. I sincerely wish all the best to you and Frannie. I don't know how to thank you. Miracles do happen and one happened this morning. The surgery began this morning with a group prayer with the doctors and family. About four minutes after beginning, the doctors pulled back the scalp to reveal the plate. When they did that, the plate literally jumped up away from his head. The doctors, five in all ... a Neuro Surgeon, Two Plastic Surgeons, Two Stem Cell Specialists and the rest of the team ... began to clean the plate and lift it away from the head. It released itself and came away clean. On the video we could hear the Neuro Surgeon say "Oh my God, look at that. How did that get there?" Under the plate was revealed a complete and intact skull bone where three months ago there was none. The entire hole in the bone which was an eight inch by six inch oval had grown completely closed with a new skull bone which was smooth and shaped to match the existing skull. It was perfect in every way and was the same thickness as the other bone. The doctors said that in 35 years of surgery they had never seen anything like it. They did not need to recreate a new skull bone at all. Dad was completely healed and made whole again after 40 years. The stem cell doctors sprayed a stem paste made from Dad's blood over the skull bone and onto the skin flap and the Plastic Surgeons closed him up. The stem paste will keep him from swelling and will encourage skin growth onto the bone. The entire procedure took about 28 minutes and after one hour in recovery Dad walked out of the room on his own, much to the anger and dismay of the nursing staff. He is coming home tomorrow. He spent one night in the hospital and was released yesterday. When we left the hospital yesterday he was hungry so we went to a nearby Olive Garden restaurant for lunch. You should have seen everyone's face when Dad walked in with this turban bandage on his head. It was very funny. As of this morning, June 30, 2007, he went bass fishing and, when I spoke to him about an hour ago, he had landed two. My Father and our family want to personally thank everyone who has sent emails and well wishes from around the world. Your prayers and positive thoughts were heard and all of our lives have been changed in such an amazing way. We cannot thank you enough. So if anyone asks you how Jimmie Rodgers is doing, please tell them that he is completely healed and is in perfect health. God bless you all and than you again so very much. My original email was sent on Monday, June 25th, to about 65 friends and co-workers that I know. That letter was forwarded and here are some of the results and responses that I received. Within a 48 hour period I received emails from Honduras, Germany, South Africa, England, France, Denmark, Sweden, the Philippines and Italy. As well as from nearly every state in the union including North Pole, Alaska. Dad was placed on the Australian Prayer Network which reaches over 10,000 prayer partners worldwide. He was also placed in dozens of prayer chains throughout the US and abroad and prayer groups were held the morning of the surgery while it was in progress. Also, I received word that 14 Catholic Churches around the country held a special mass for Dad the morning of the surgery. On XM Satelitte Radio a DJ named "Matt the Cat", who hosts the 50's on 5 show, paid tribute to Dad the night before the surgery. Dad called in to thank him and Matt said "Jimmie we are going to make you a miracle" and then he played Dad's record of the same name. It was very touching and Dad teared up a little on that one. Also on XM Radio the Rollye James Show had a tribute program for Dad as well and fans from all over the country called in and said that they were praying for him. This is just an example of the response one email request for prayer can receive when sent to such a limited group of people. I firmly believe that Dad was healed and given a new skull bone because of the faith of Dad, our family, and so many people throughout the world. Please never forget that prayer works. Prayer is powerful. God is Great! Please forward this letter to everyone that you might have sent the prayer request to so that they may know the outcome as well. The "Oldies Community" really jumped on the bandwagon on this one ... our sincere thanks to EVERYONE on the list who said a prayer or helped us put the word out to other music fans out there regarding Jimmie's recent battle. (Boy, it SURE is nice to get GOOD news once in a while, isn't it?!?!?) To all the jocks who went out on the air with this ... to EVERY fan who whispered something to The Big Guy Upstairs ... sincere thanks from Jimmie and his family. In a world filled with so much BAD news, this truly is an ASTOUNDING story. Thank you, thank you, thank you, for this is by far one of the ultimate and most inspiring pieces I have ever read since I have been a part of the Forgotten Hits family, which has been from the beginning. Prayer is powerful!!! God is awesome!!! Jimmie, literally had thousands and thousands of people being intercessors for him and his miracle healing. Thank you, Jimmie and family for sharing your amazing story with us. Thank you, Kent for passing it on. I've passed your sentiment on to the Rodgers family. Isn't it SAD how RARE it is to hear GOOD news these days?!?!? Everyone is SO focused on pointing out all that is wrong ... but this sounds to me to have TRULY been a miracle. 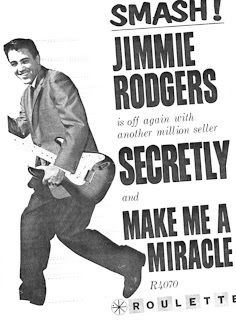 It seems only right to feature Jimmie's 1958 Hit "Make Me A Miracle" today ... released as the B-Side to his #4 Hit "Secretly", "Make Me A Miracle" earned enough sales and airplay to chart on its own in Cash Box Magazine, peaking at #31. This week we've been trying to tie up a few loose ends ... and catching up on some topics that we've covered in some of our previous Forgotten Hits features ... which got me to thinking about 1950's and 1960's folk / rock singing sensation Jimmie Rodgers. Two years ago we reported the details of Jimmie's life-saving surgery to remove a 28" metal plate from his skull that had been there for the past forty years. The good news ... in what doctors called nothing short of a miracle ... is that Jimmie pulled through that surgery with flying colors ... but we couldn't help but wonder how he was doing two years on ... so we contacted his son Michael for an exclusive Forgotten Hits update. Any problems post surgery? Was his father living a better quality of life? We wanted to know the latest. Jimmie Rodgers was one of the early Rock And Roll Pioneers ... in fact, he was able to incorporate both a Folk Sound and a Country Sound to his music and, in the process, carve his own path up The Popular Music Charts. Between 1957 and 1967, Jimmie scored fifteen Top 40 National Hits (and just missed with a couple more.) Honeycomb (#1, 1957); Kisses Sweeter Than Wine (#5, 1957); Secretly (#4, 1958) and Are You Really Mine (#10, 1958) went all the way into The Top Ten ... while others, like Oh-Oh, I'm Falling In Love Again (#13, 1958); Bimbombey (#11, 1958); The Long Hot Summer (#49, 1958); Make Me A Miracle (#31, 1958); I'm Never Gonna Tell (#36, 1959); Because You're Young (#30, 1959); Ring-A-Ling-A-Lario (#32, 1959); Wonderful You (#40, 1959); Tucumcari (#32, 1959); T.L.C. Tender Love And Care (#24, 1960); Waltzing Matilda (#41, 1960); Just A Closer Walk With Thee (#44, 1960); The Wreck Of The "John B" (#50, 1960); No One Will Ever Know (#43, 1962); The World I Used To Know (#51, 1964); It's Over (#37, 1966) and Child Of Clay (#30, 1967) kept his name on the charts and his voice on the radio for over a decade. Then, in 1967, a very strange tragedy struck. Jimmie was driving home from a party in December when he was stopped on The San Diego Freeway by an off-duty policeman. The events that transpired AFTER he was stopped have been a point of contention for the past 40 years. The "official" police report states that Rodgers fell to the ground while being questioned about his "erratic" driving. Rodgers has always maintained that he was THROWN to the ground, attacked and beaten. (I've also read that he was attacked through his window ... most likely with a tire iron ... when he rolled it down to see why this other car had forced him off the road.) In EITHER event, he ended up hospitalized for over a year, undergoing three brain operations during which time a 20 square inch steel plate was implanted under his scalp, literally forming part of his skull!!! (One can only surmise that if the official police report is correct, he must have "fallen to the ground" quite a FEW times as he also had multiple leg and arm injuries!!!) In fact, Rodgers once said, "My doctor told me that I'd have had to jump off the roof of my car eight times, landing on my head, in order to cause that kind of damage." Lawsuits transpired for the next several years before things were ultimately settled out of court. Incredibly, 40 years later ... in March of 2007, the story broke that Jimmie went in to have a surgery to remove this metal plate in his head. We broke regular news updates in our Forgotten Hits Newsletter (courtesy of Jimmie's son Michael), letting our readers know (and, in effect, much of oldies land, thanks to the deejays on our list) that the surgery was a COMPLETE success ... incredibly, during the interim forty years, Jimmie's skull had grown back to its original state. Pretty amazing and miraculous if I do say so myself!!! We experienced a TREMENDOUS outpouring of prayers and well-wishes ... as well as thanks for all the great music that Rodgers has given us over the years ... all of which were forwarded on to Jimmie in the hopes of helping with the healing process. Dad is doing great and enjoying life to the fullest. He is still busy with writing projects and playing golf most days. Currently he is on a road trip and is expected here in Nashville sometime next week. When I see him I will tell him of your email and your request to speak with him. Thanks again and please thank everyone with your group for the love and support that you have all shown my father. We're hoping to bring you a few words from Jimmie himself in the days to come. In the meantime, we'd like to offer THIS suggestion: For YEARS now, there's been talk about doing a Jimmie Rodgers bio-pic ... with this INCREDIBLE fairy-tale ending to the story, wouldn't this seem to be the PERFECT time to do so?!?!?!?? Here's one of my all-time favorite Jimmie Rodgers tracks ... sadly, his LAST chart hit. From 1967, it's "Child Of Clay", our featured track in Forgotten Hits today. Some of you may remember a discussion that we had a couple of months back regarding the song "Gimme Some Lovin'" and the fact that, here in America, a group called The Jordan Brothers actually released THEIR version first ... despite the fact that the song was written by Stevie Winwood and recorded by his band The Spencer Davis Group. The question came up, "Could the ORIGINATOR of the song actually "COVER" their own tune." I was listening to Scott Shannon's show last weekend on channel 1340 Reading, PA, when he was playing originals and remakes that might have done better than the originals. "Give Me Some Lovin' written by Steve Winwood, was originally recorded by the Jordan Bros, a band from Schuylkill County, Pa. The record was selling so well that Winwood decided to record it again himself. He had better connections than the Jordan Bros, so his record went national. Just some more rock and roll trivia. The Jordan Brothers version was released in 1966 but didn't manage any chart action until after the release of the Spencer Davis Group version the following year, and bubbled under in 1967. How it got into their hands, I have no idea. All I know is the Philips record number that it was issued on is smack dab in the middle of a hundred other 1966 releases while the Spencer Davis version didn't get released on United Artists until 1967. The Jordan Brothers had some much better records than that one, though they didn't manage any decent chart positions with their songs. If Stevie Winwood wrote "Gimme Some Lovin'", I don't see how you can really consider any other artist "covering" the song before he did it. Maybe it was a hit in England before it was a hit here or something and that's how The Jordan Brothers discovered it, I don't know, but clearly it's a Stevie Winwood song. Sounds to me like The Jordan Brothers just had a local Philly hit with it. 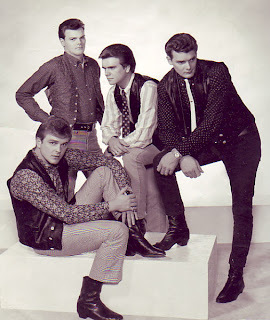 We had a number of Chicagoland acts "covering" Hollies tunes before The Hollies really made much of an impression on the national charts ... because they had access to import albums and such. (The Cryan' Shames ... one of the artists we'll be featuring this weekend ... had planned to release their version of The Beatles' tune "If I Needed Someone" as their first single ... but reportedly George Harrison put the kabosh on that idea after The Hollies' cover version of the same song failed in England. Instead, they broke through with a remake of The Searches' tune, "Sugar And Spice".) Clearly, the American bands were checking the British charts, looking for ANYTHING that would sound enough like a British hit to actually get played on the radio. The Buckinghams took their name as much from Chicago's Buckingham Fountain as they did from Great Britain's Buckingham Palace!!! The New Colony Six were inspired by the first colonies set up here in America who broke away from British rule. And on it goes! As far as how these bands continued to find songs that most of us casual listeners weren't even aware of, we have to remember that back then it wasn't at all uncommon for the track line-ups to differ between the UK and the US album releases ... so I suppose The Jordan Brothers COULD have heard the song, jumped on it, and released it before The Spencer Davis Group single hit the charts here in America. (Actually, looking at the charts above, they pretty much charted simultaneously!) Again, not all that uncommon back in the wide-open AM Top 40 programming days when a local artist could chart with the same song as a major artist ... here in Chicago, we heard The Mauds' version instead of the classic Sam and Dave version of "Hold On." And that's pretty much how things have sat for the past two months. I have tried on a few occasions to send this and to no avail. Found out today that I had a computer problem. That being rectified, I pray that this will finally go through. Artists back in the 50's and 60's relied heavily on the record company's people to come up with a hit for them. This was the case with The Jordan Brothers' band. Upon recieving a phone call from the people at our record company in New York, we packed up our instruments and, along with our father, we went to the Big Apple. The people at our company played a "demo" or demonstration of the song Gimme Some Lovin' for us to hear and approve. We all agreed that we liked the song and agreed to record it. Little did we know that it was the actual 8 track tape we listened to containing Steve Winwood's vocal, organ, a lead guitar, bass guitar and drums. The other remaining tracks were open for any additional accompanyment. We did not know this at the time or how our record company got hold of the original recording. We may never know. Or how the other record company that recorded the other tracks on it got a hold of it. We learned the song, recorded it on that same trip and it was released in three major cities in the U.S. So, we did have the first release in the U.S. and the record took off immediately. It boasted huge sales in three major cities which would make the Spencer Davis version seem like it was a cover. The Spencer Davis version was inhanced with more instrumentation and background voices which gave it somewhat of a "soul sound", a term used back then for a sound produced at Motown records which was very popular at the time. The Spencer Davis version was released and it got immediate attention. It didn't take long for it to take over our version and cover it. Our apologies for any confusion this may caused to all concerned, but most importantly, to our fans, for any inconvenience or misleading this might have generated. We thank you all for your interest and that this clears this controversy up once and for all. Cool Kent! Furvus of The Fifth Estate here. The guys will probably kill me when they hear what I sent to you and how raw and unfinished they are. Jeesh - I'm as good as dead! The first is Around and Around which, of course, everybody played at one time or another - but the interesting thing here possibly is that this is something the band played right off after not having been together for 35 years. First take - no rehearsal - and in some sense it sounds like it. Rick didn't remember the words - the guys didn't remember any sort of arrangement and Bobby Lee on piano in place of Wayne had never played it with us before. But all in all I think it feels pretty good and is a fair indication of how we sounded 40-30 years ago!! We were a real American Rock and Roll band! We could play on the same stage with anybody. We still are and we still can!!!! The second is a DEMO of a new tune to be on a new album called TIME TUNNEL we hope to have completed this Summer. Like Around and Around it is just the five of us playing the song - nothing fancy. Straight ahead musicians who could sing, write good tunes, and who love playing Rock and Roll. I'm Furvus the drummer on this and I'm playing a 2 and 4 rock and roll beat like Ringo used to play, but against (at the same time) a Bo Diddley beat like my favorite drummers Clifton James and Frank Kirkland used to play. Remember those days?? Ahh - man ... It doesn't have the lead guitar fills or parts on it yet - so it sounds a bit "open" to me. Plus it is just a 2nd take DEMO track (boy the guys are gonna kill me?? ), but it at least gives somebody an idea of how we sound on our new stuff today. We will have our first live show in 30 years at an amusement park in CT as a fund raiser in Sept. We hope to keep it going from there. It will be good to be in front of an audience again. Here's a picture of us these days in case you are looking for something really ugly to look at. Thanks for asking and doing what you are doing for all the music we all love so much!!!!! The new Blue Truth CD promo copies are done, our final packaging, barcodes, etc. are in the works. The CD will eventually be for sale on our website, CD Baby, and I Tunes, and at our shows. The CD includes 11 songs recorded Live at our Holiday show last December. Included is Mercy, Mercy, Mercy with the original lyrics written for the Mauds by Curtis Mayfield (different from the Buckinghams) and an old Mauds blues tune, You're Gonna Need Me, in addition to other great rock, soul and blues "standards" done Blue Truth style. There is even a 13 minute + version of Them Changes by Buddy Miles with a 60's-style psychedelic jam in the middle. The recording is studio quality and Jimy's voice sounds better than ever. Please let me know if there is any further info you need. In case you can use them, here are two edited & shortened versions of vastly different forthcoming releases of mine. The first will be on a CD titled, "Doo Wop In The 21st Century" & the second on my "Mr. Northern Soul" CD. The first is an a cappella recorded 'oldie' ("Only A Dream") that's newly written and recorded by me ... and the second is my revised and remixed version of "16 Tons" ... which I used in a recent video on You Tube. Please send my best regards and mention to your audience and our friends to please check out my video page on You Tube. I'd greatly appreciate it. I've got about 40 videos posted, and if you or they would subscribe to my page there, every time I post a new audio-visual, they will be notified by You Tube. I hope you enjoy them, and please let me know if you might decide to use these mp3s on your site.